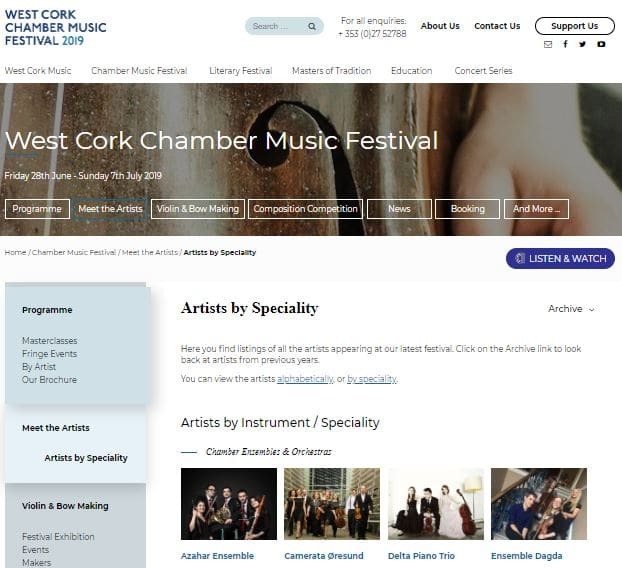 West Cork Music is involved in several projects, not just festivals, and our webpages reflect our complexity – we effectively have 5 to 6 sites. 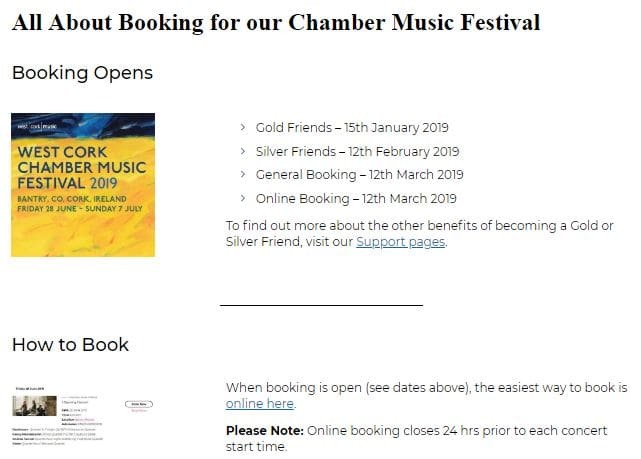 Our West Cork Chamber Music Festival site is the first to go live – our other sites will roll out in the coming months and you’ll be directed to our old webpages for them in between times. Our new pages are a custom coded WordPress website created from scratch, designed by the multi-talented team at Matrix Internet whose skills, enthusiasm and dedication to the needs of the users – both ourselves and our audience – have been invaluable. Everyone involved at West Cork Music & Matrix have been working hard to create this new website over the past few months – and we can’t wait to share this exciting new development with you. We’ve kept many of the original features of our old site – if it ain’t broke, don’t fix it – and we’ve added improvements to make it even better – including a beautiful, clean, modern design; easy navigation; and plenty helpful text and links. Keep reading to find out the new design features that make our site easier for you to use and enjoy. And don’t miss the great input from Matrix about the design process – and how much we enjoyed working together – at the end. Please enjoy visiting our new site – and do let us know any constructive feedback. Don’t forget praise is always welcome too! We also have a new, separate listing for our Fringe Events – they’ll be announced by May. And we’ve added information so you can choose to read our brochure in whatever format is easiest for you. 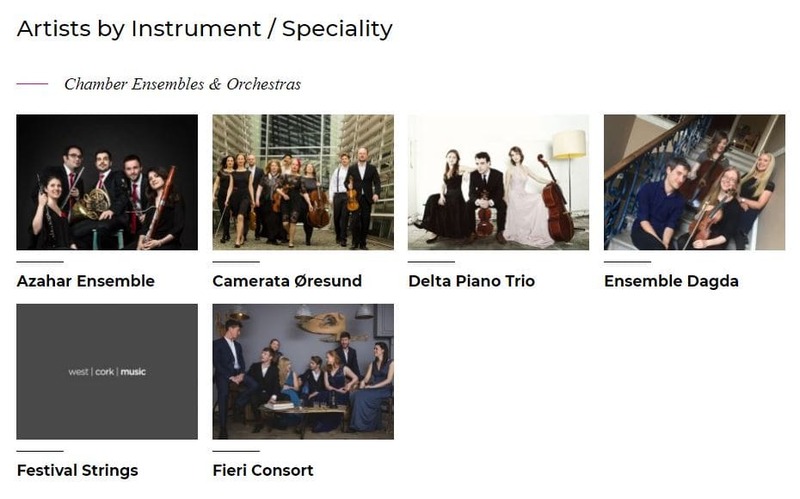 You can still view our Artists by speciality/instrument – and we’ve added an alphabetical listing too, so you can find any individual artist easily. We’ve added pictures and adapted the layouts to make the pages more visually pleasing. And you can still easily check the events each artist is appearing in. 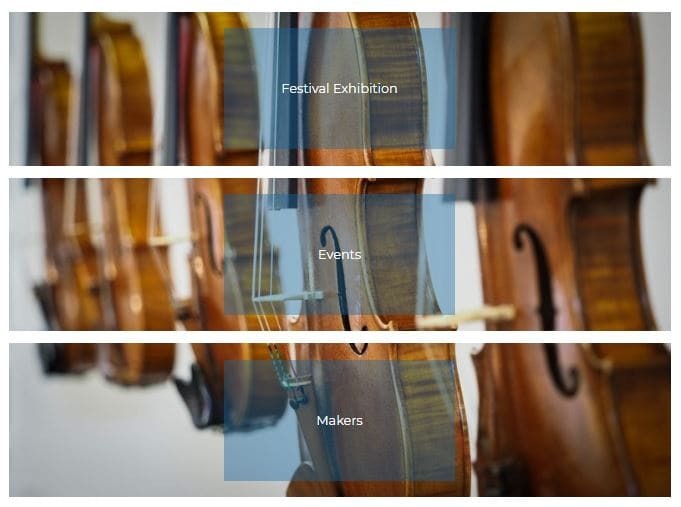 Both our Violin & Bow Making and our Composition Competition pages have been redesigned for better information provision. And they showcase new navigation aids we love – designed by Matrix, just for us. We’re particularly delighted with our News pages. You’ll find a total redesign, allowing you to view News items not just by date, but by topic – with more topics to come as we roll out our other sites in the coming months. Our new Booking pages are much more comprehensive. You should be able to find the answer to all of your booking queries here. You’ll be pleased to know the new site is fully responsive to all devices. For example, we’ve used links, rather than images, and minimised line spacing for mobiles so you’ve less scrolling to find what you’re looking for. You can still access our Audio & Video Archive from any page on the site to watch videos and listen to recordings of festivals past – just click the Listen & Watch button in the header or side menu. We’ve added a new FAQs page – responding to the feedback we’ve had at festivals. 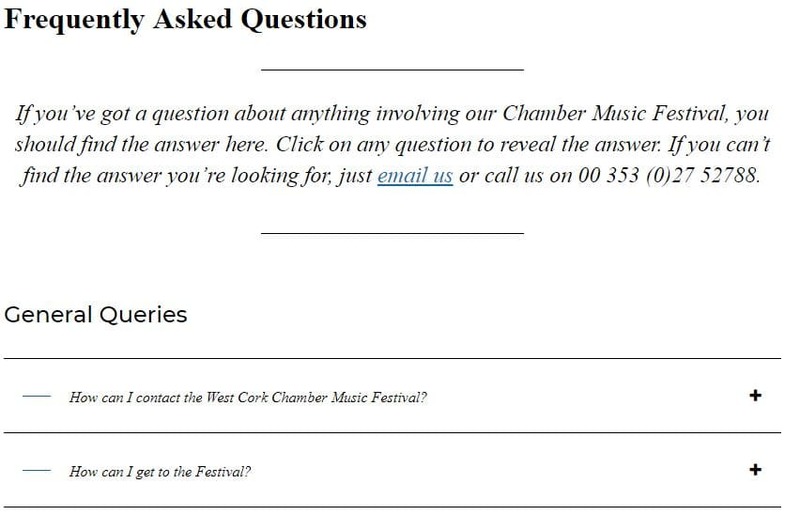 This page, we hope, will have answers to any question you may have about anything related to our West Cork Chamber Music Festival. You can see all our contact information – including a map showing how to find us – in the footer. And you’ll find all our social media information there too. And a lovely wee up-arrow appears at the bottom right of the page as you scroll down – it’s a Back To Top button – and really useful on the longer pages when you want to get back to the menu again. You’ll see it there now. 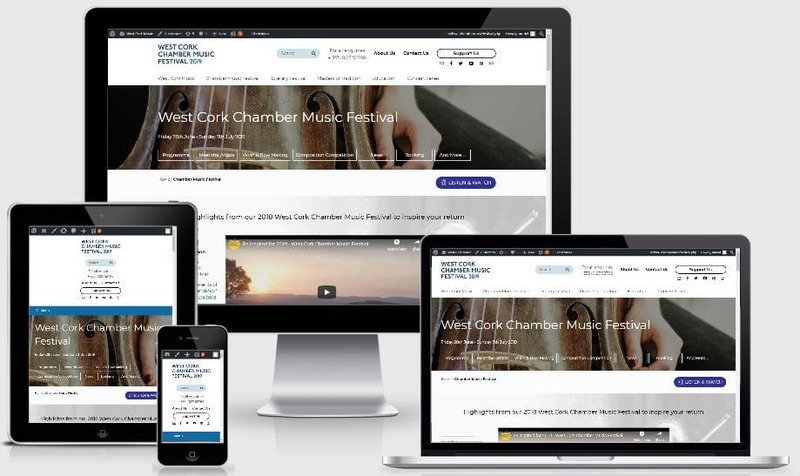 When we first discussed the project with Muriel and the team at West Cork Music, we knew that we had the capabilities required to deliver a beautiful, yet easy to use, website for West Cork Music’s users. The challenge was to channel the unique ethos and passion of West Cork Music into something that is highly accessible but also aesthetically pleasing. Essentially, we were looking for a beautiful online harmony but hitting many high notes! Having being part of the OPTIMISE programme (sponsored by the IE Domain Registry) over the last few years, we have gathered a lot of knowledge around the Irish crafts and arts digital space, and we knew that our team of digital experts, with particular expertise in User Experience (UX) design, User Interface (UI) design, development and marketing, could put this to good use when planning and delivering the website experience for West Cork Music. Our approach to creating the new West Cork Music website was to start with a series of UX workshops based on the design thinking process. We wanted to reframe the problems that users were having with the existing website in human-centric ways so that those issues were sorted with the new, enhanced user experience. This led us to create black and white ‘wireframes’. 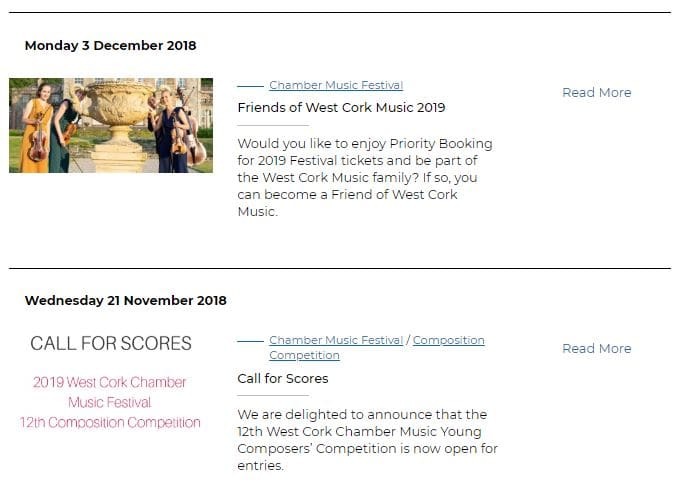 Once both teams were fully satisfied that these wireframes answered to the users’ needs, we proceeded with our design process and transformed these lifeless wireframes into beautiful frames that portrayed the artistic voice of West Cork Music. After finalising the design, we proceeded to code the website that’s not only easy to use, but also effortless to update and maintain. We would like to thank the entire team at West Cork Music, as this project was truly a marvellous team effort. We’d not have been able to come up with such a fantastic website without the help of Muriel and everybody involved. They were always communicative and easy to deal with, which helped shape the website into what it has become – a piece of art in its own right of which we are all very proud. We’ll keep you posted. And do let us know what you think – we’d love to hear from you. We’d like to thank a few people before we end this news item. Firstly, many thanks to Loughlin McSweeney for designing our old webpages back in 2012, and for looking after them so well for so long. We wish him all the best in his new career. Much gratitude also goes to Benson Russell, our Festival photographer – many of his beautiful pictures are central to this new site. Stuart Coughlan of edit+ also deserves our appreciation. Stuart has been designing our excellent brochures, programmes and publicity for many years and has been a great help with imagery and input during the site design. Finally, our thanks go out again to this site’s designers – the gang at Matrix Internet: Charlotte, Iñaki, Peter, Richard and Virginia – it’s great working with you, we love our new site and we look forward to working with you for years to come!